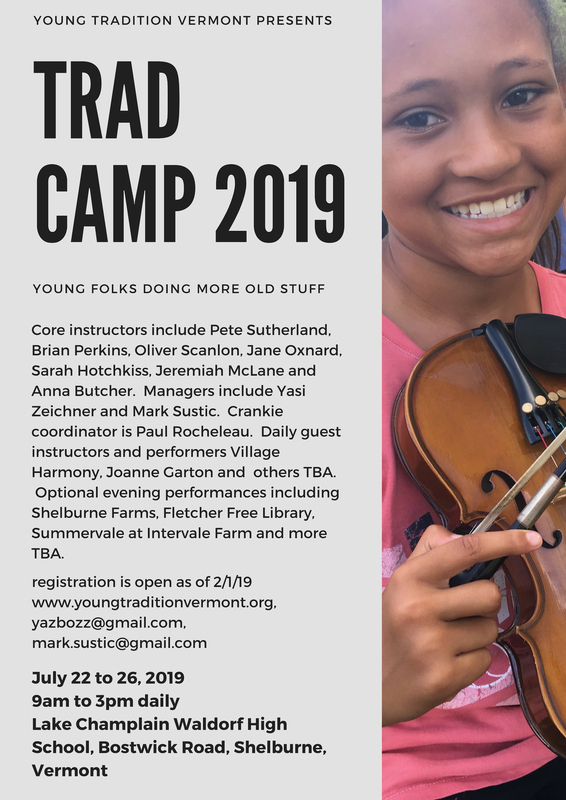 Young Tradition Vermont Registration is open for YTV Trad Camp 2019! Registration is open for YTV Trad Camp 2019! Join us from July 22-26 at the Lake Champlain Waldorf High School campus for a week of traditional music and dance, taught by core staff Pete Sutherland, Oliver Scanlon, Jane Oxnard, Brian Perkins, Sarah Hotchkiss, Jeremiah McLane, and Anna Butcher, and guests including Village Harmony, Joanne Garton, and more! The age range for Trad Camp remains 8-17. Cost is $275 for early registration, and $300 after May 1st. If you have questions, contact Trad Camp manager Yasi Zeichner at yazbozz@gmail.com, or Mark Sustic at mark.sustic@gmail.com.